Recorded at Belgrave Harriers, Wimbledon, on Dec. 20, 1975. Since Ken Colyer’s death in March, 1988, a considerable number of Colyer CD’s have been released, not all of which would have received his imprimatur, I believe. However, this new CD from Upbeat is not one of those. It was well-recorded in the first place by John and Renee Long, the transfers by Bernard Harris are excellent, and the engineering by Sound Performance is first class. Mike Pointon, who produced the album and wrote the accompanying booklet, is to be congratulated, along with Liz Biddle of Upbeat Records who brought it to fruition. (I trust I haven’t left anyone out!) But it is truly a fine CD. All of the above accolades would be meaningless if the music itself were unremarkable. Such is not the case. Although there are only seven tracks, they add up to just over 72 minutes of first class New Orleans-style jazz, the kind that Colyer dedicated his life to playing. The band he assembled for this gig was not his own, as he had stopped leading a band on the advice of his doctors some three years before, but he didn’t stop playing and he put together such all-star groups from time to time. Several of the members were from his former bands, so all in all the players have no trouble coming together cohesively; in addition, Colyer was a master at “shaping” a group’s sound into what he wanted. All of the tracks but three are ten minutes or more in length, and the three that are not all exceed seven minutes The disc opens with I Ain’t Gonna Give Nobody None of My Jelly Roll, taken at a leisurely tempo which would be ideal for dancers. The first chorus is taken by the clarinet in Bird’s warm chalumeau register, the succeeding ones in the middle and upper registers. The Colyer mark is everywhere in his lead and solos—the soft volume, the slight vibrato toward the end of each phrase, the use of mutes, especially the aluminium hat mute. And, of course, the emphasis on ensembles, so essential to this style. In addition, mention should be made of Bowden’s nice accents with wood blocks and toms throughout the track. It all adds up to a superb musical treat, almost thirteen minutes long but a hardly noticeable duration, and a wonderful introductory track to the CD. Despite the tracks’ totalling few in number, they display a variety of tempi and type. The fastest, Isle of Capri (a tune frequently recorded by Colyer), is least successful to my ears. It seems to want to rush even faster than it is played, but in effect cannot go any faster. Annie Hawkins does a yeoman (yeowoman?) job of playing four to the bar all through the tune—lesser bassists would have collapsed into two! Similarly Bill Stotesbury manages to keep up, and both, along with Bowden, handle their breaks at the end quite well. How the dancers fared with this number is unknown, but they probably had their work cut out for them. The addition towards the coda of the popping balloons contributes to what seems to come close to organized chaos. However, no train wreck occurs on stage. By contrast, one tune is taken at a particularly slow pace— Just a Closer Walk with Thee, another Colyer favorite——being played as a dirge, and that for the entire track. When I was listening to it for the first time, I felt sure that at least half way through the band would go into quick time after a lead-in break from the drums (as is so often the case with other bands’ versions of this tune), the snares being thrown back on, so that it becomes a march away from the cemetery, rather than a lead up to it. But such is not the case here. Bowden keeps laying down the slow, muffled snare drum taps and rolls, some of these being with a slight crescendo, all the way. The clarinet takes the lead after the introductory choruses and then trades it with trombone. This is followed by a muted cornet solo, a good bit of single string banjo being plucked behind the cornet. Next is an open (as opposed to muted) trombone, with some growling and glissing as appropriate. When the piano takes a solo, one chorus is given to triplets, much like rhythm and blues. Finally, Colyer comes in with the vocal, singing all the verses with his signature nasal resonance, backed by a soft ensemble. Then the others come in at the refrain with a backing riff: “Walking with Jesus. Talking with Jesus.” On the out-choruses we are treated to the trombone backing and harmonizing with the cornet, the clarinet weaving around both, the whole group ending with beautiful dynamics in the closing phrase, fading into almost nothing. The fifteen minutes pass very quickly, indeed. While the first and sixth tracks are, for me, the highlights of the CD, the others have their moments, too, such as [My] Life Will Be Sweeter Some Day where there is the wonderful interplay among front line members that resolves nicely into a riff behind clarinet; and later, the drum break at end of the banjo solo leads straight into the ensemble and then is repeated again between out-choruses. Another is at the end of Dinah where a fine glissando from trombone leads into the ensemble out-choruses, and then the coda builds as much in intensity as in volume. After the seeming end and clean stop, a drum break leads back into the closing riff followed by an ensemble bridge and then out. 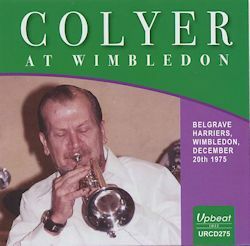 Altogether, then, this is an excellent CD and most certainly Colyer aficionados will want to have it. But anyone who likes the New Orleans style will find it most congenial. It is a little over an hour and ten minutes of fine music that will not be out of place in anyone’s collection.